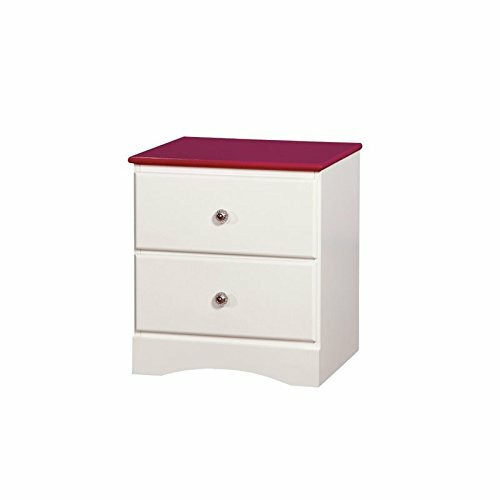 Brighten up your little one's room with the Beller Transitional 2-Drawer Nightstand. A fun two tone finish in pink and white for a vivacious design, the nightstand offers two (2) spacious drawers equipped with center metal glides for storage space and crystal-like acrylic knobs embellish the drawers beautifully. Product frame is made of solid wood. Spot clean recommended. Minimal assembly required. Product made in Vietnam. Product made in United States. Once assembled, Nightstand measures 18.88 inches wide by 16 inches deep by 21.25 inches high. ; 30-days hassle-free replacement parts warranty. Pictures are for illustration purposes. All décor items are not included in this offer.